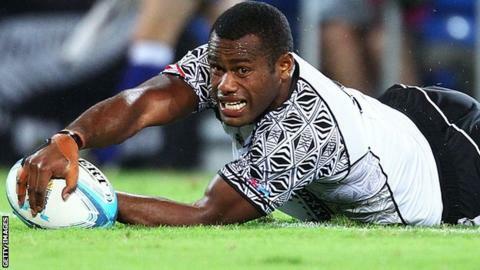 Exeter Chiefs head coach Rob Baxter says potential new signing Watisoni Votu has impressed him after he made his international debut for Fiji. The 27-year-old has agreed terms to join Exeter, but needed to play a senior international match before being eligible for a work permit. He has played against Japan and Samoa this month and Baxter has liked what he has seen from the powerful wide man. "He's played exceptionally well so I'm really pleased," Baxter said. Exeter did not have a chance to see him play any 15-a-side rugby, but did see him play for the Fijian sevens side, and his performances convinced the Chiefs to push on with a bid to sign him. "I'm not going to say it was a gamble, but we felt he was a guy who would be worth us having an extended look at," the Chiefs boss told BBC South West. "It was worth us seeing if we could put an offer on the table and bring him over here, and if that hadn't have come off and the international 15s fixture hadn't come off we'd have taken it on the chin." But Baxter says now that Votu has played for Fiji and played well, he could play for the Sandy Park club from early on next season. "I think he's a guy who may feature at the front end of our squad a little bit earlier than we would have initially thought," Baxter added. "We thought that transition from sevens to 15s takes a bit of time, especially when you talk about the Premiership. "But looking at how he's played against Japan, and especially against a very strong Samoan side, he's definitely got some attributes that could see him featuring pretty quickly. "If he has a good pre-season he could be fighting for a spot." Standing 6'2" tall and weighing in at almost 16 stone, Votu is a type of powerful winger that the Chiefs do not have in the likes of Matt Jess and Argentinian international Gonzalo Camacho. And Baxter says he has the potential to be a star in the Premiership. "Watching this guy we felt that potentially he could be a young guy that could develop, with a bit of 15s rugby, to become something special."